Team Virginia had quite the showing in day one of the 2018 National Championships. That included two national champions and five All-American finishes. There were only four championship events on Friday and Team VA won two of them. The first of them was the Swedish Medley Relay (1-2-3-4) where Western Branch ran away with the title and almost broke Union Catholic's national record. They ran US #3 all-time 2:06.63 for the win. 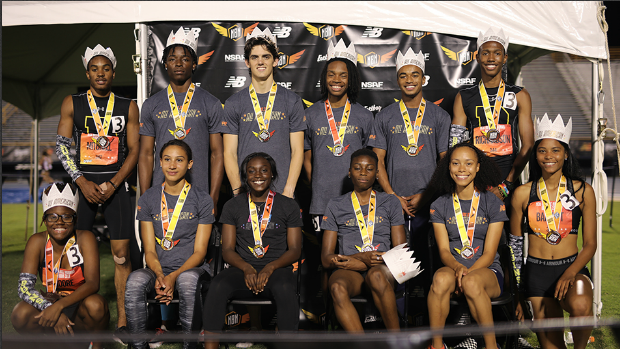 Finishing as All-Americans in that event was Bethel in the boys' race finishing in 5th (1:56.85) and Team War (Nansemond River) in the girls' race finishing in 2nd (2:08.40). The next event up for Team VA was the Mixed 4x4 where two girls and two boys team-up in their chosen order to race to the line and against the clock. Here it was all Western Branch who took the other teams to school with their boy-boy-girl-girl order. Western Branch went 1-2-10 in that race. Bethel was 3rd, Fairfax was 6th. Finishing just outside of the All-American top six was Colonial Forge in 8th and Prince George in 9th. Though these winners were not in the "championship" section they certainly embodied what it meant to be a champion. These guys and girls set state records and also set the bar very high nationally too. The two biggest performances from the day were Jazmine Tilmon's 13.36 100mH victory and Keyonte Midgett's 48-4 triple jump win. They weren't the only ones winning though. Highland Springs girls also set a meet record en route to their 800m SMR victory (1:43.20). That broke Western Branch's meet record from 2011. The only other champion on the day was Rawle Brebnor Jr who went a blazing 10.51 to take the EE 100m final. Finishing just behind the win but with strong performances were Tania Dunbar going 14.12 (100H), William Spencer going 14.09 (110H), Isaac Haywood going 46-4.75 (TJ), and Oscar Smith girls going 1:47 for second in the 800 SMR. They may be young but they certainly aren't not stars already. Here we had two winners for Team VA. Jordan Hardy won the long jump (18-8) and Malcolm Johnson won the 100m final (10.62). They were joined by some great performances too. Jahnelle Saunders went 18-4.5 for second in the long jump and Eleyah Armstrong went 11.96 in the freshmen 100m final.